Savvy Spending: HOT: Moana Blu-Ray +DVD for just $12.99 at Walmart for NEW Top Cash Back members! ENDS TODAY! HOT: Moana Blu-Ray +DVD for just $12.99 at Walmart for NEW Top Cash Back members! ENDS TODAY! TopCashBack is offering a rebate of $10 for NEW members when you order Moana Blu-ray for $22.99 from Walmart online. This is valid TODAY ONLY! Sign up for an account with TopCashBack (this offer is for NEW users only, but you may have more than one account per household, so sign up your spouse or adult child). 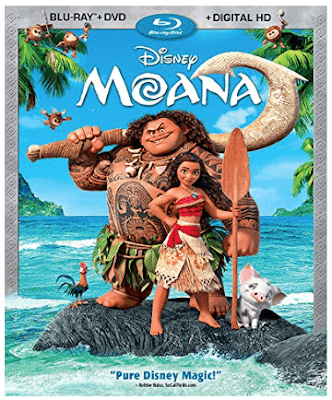 CLICK this link: Walmart Moana offer on the TopCashBack. You should see the $10 rebate offer. Click the “Get Cashback Now” button to be directed to the Walmart site. Add Disney’s Moana (Blu-ray + DVD + digital HD) movie (priced at $19.96) to your cart. If the price is outside of this range, the offer will not work. Continue to checkout. DO NOT BUY ANYTHING ELSE IN THIS ORDER or you won’t get your cash back. Select ship to store to avoid shipping fees. Pick it up in store when it's ready! Pay $22.99 + tax. Wait for your $10 cash back rebate to appear in your account within 7 days. You can then choose to have your cash back added to your PayPal account or get an extra bonus if you choose an Amazon gift card! I use TopCashBack all the time and it is super easy! FINAL COST for the Moana Blu-ray + DVD + digital HD: just $12.99! HURRY, this offer ends today!